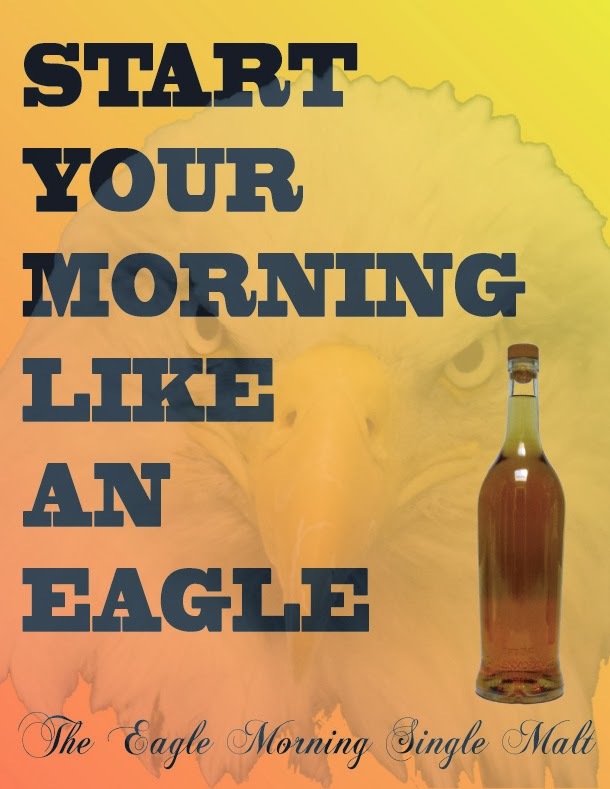 Yesterday, I wrote about the creation of The Eagle Morning single malt. It was a labor of love -- okay maybe not that much labor, just waiting and rotating. My hope was that it would be similar to its source malt, but different; perhaps some peppery spice and barrel char to go with the vanilla and oranges. I also hoped for a wild card unknown maturation quirk to set in and create something unexpected. I was also a little worried. My first maturation experience, The Rye Storm, had resulted in a hot mess, emphasis on HOT. There's a reason I haven't let anyone else drink it: I'm not entirely sure it's safe for consumption. The barrel had, by my measurement, absorbed 64mL of the rye. What the heck would that do to the soft cuddly malt in the second fill? After the first 31 days in the barrel, The Eagle Morning's palate hadn't changed much; maybe a little more tannic on the finish. But the nose had picked up a lot of barrel char to go with the malt's citrus. A nice anise note had also developed. Four days later, with the evaporation rate climbing and all new notes forming in the whisky, I chose to bottle the stuff before the oak and angels took over. Then I let it settle in the bottle for two months, as I've found many of my higher-ABV bottles improving with a tiny bit of oxidation in their first month or so. I did a number of tastings throughout and then...well, here we are. The color is an orangey gold. The nose starts with spicy tangerines, orange peel, overripe peaches, and mint leaves. There's quite an ethyl buzz making it feel younger than it is. There's also a dollop of vanilla, tree bark, floral perfume, sugary cereal, and peach schnapps. With some air, notes of toasted grains and dusty black pepper arrive. Lots of the barrel in the palate. Sweet at the start, a little spirity at the end. Strong malted rye note. Subtle vanilla, lightly tart, peach liqueur, and overripe peaches. It finishes salty with the drying tannins rolling in. Notes of chocolate milk, mild vanilla, newspaper and ink, malted rye, and a hint of the peaches. Lengthy. The nose steadies but flattens. Some more pepper notes appear. The palate actually improves a little as it gets more sugary and creamy. More vanilla. The finish gets bitterer, and The Rye Storm has the last laugh. Like The Rye Storm, the nose is the best part. But unlike my rye experiment, The Eagle Morning is actually very drinkable. It keeps enough of its light nature to still be a good summer malt and holds strong against some ice cubes. Though it feels a little younger and stranger than its source malt, The Eagle Morning has been my go-to whisky during the late-and-extended summer heat. While I don't think I improved upon the base malt, this has been a minor success. Will there be a third fill? I don't know. The crazy malted rye notes have imbedded themselves deeply in the oak and I'm beginning to tire of them. I also question the oak itself: its thickness, its porousness, and its cooperage. If there is a third round, it's going to be goofier and cheaper than these previous two experiments. In the meantime, I'm going to fix me an Eagle's Highball to fight the mid-November 94-degree heat. If I were a braver (and richer) man, I would have exchanged one of the bottles of Original with Astar just to see if the higher alcohol content would change anything. Of course, you'd be out $76 (plus the two bottles of Original) if the experiment went wrong in a bad way. Yeah, there are no guarantees with these mini casks. The crazy angel's share taken during the rye's maturation convinced me to keep the costs down on this second experiment. One of the main quirks is that the liquid/water is evaporating faster than the alcohol so the end result gets much much hotter than the stuff poured in at the start. By keeping the ABV low, I keep the darn thing drinkable at the end. The Rye Storm is insanely hot, almost undrinkable, and that started at 46%ABV.